Camper Adrian Torres took part in one of the summer activities at Camp Harbor View on Long Island in Boston Harbor. Sitting near the shore on a bucolic Boston Harbor island, 17-year-old Lereca Rodrigues thought back to when a cousin was shot last year in an inexplicable act of violence. “He didn’t have that camp, or that support from somebody else behind him, or family to keep him off the streets,” the high school student from Dorchester said. Rodrigues, however, has that support: Camp Harbor View on Long Island, which she has attended since she was 11. She was among 100 former campers who have returned to become leaders in training, spending the summer learning how to mentor the next generation of Boston youths in civic engagement and community action. “I feel like Camp Harbor View has had a big impact on my life and where I am today,” Rodrigues said. As youth-led social movements have gained attention nationwide, the camp’s leadership program added a new civics course this summer offering the high school students lessons in creating community action on issues such as racism, classism, Boston’s housing crisis and gun violence. Thursday was a special day on Long Island, as Mayor Martin J. Walsh toured Camp Harbor View and led a discussion with 16 trainees. Walsh spoke about the challenges of being a young leader, how he handles criticism, and what it’s like being a white mayor in a majority-minority city, among other topics. “These young people are the future of our city and our country,” Walsh said after the meeting, referencing the March For Our Lives movement by teenagers in Parkland, Fla., and the youth-led gun violence protests in Boston. 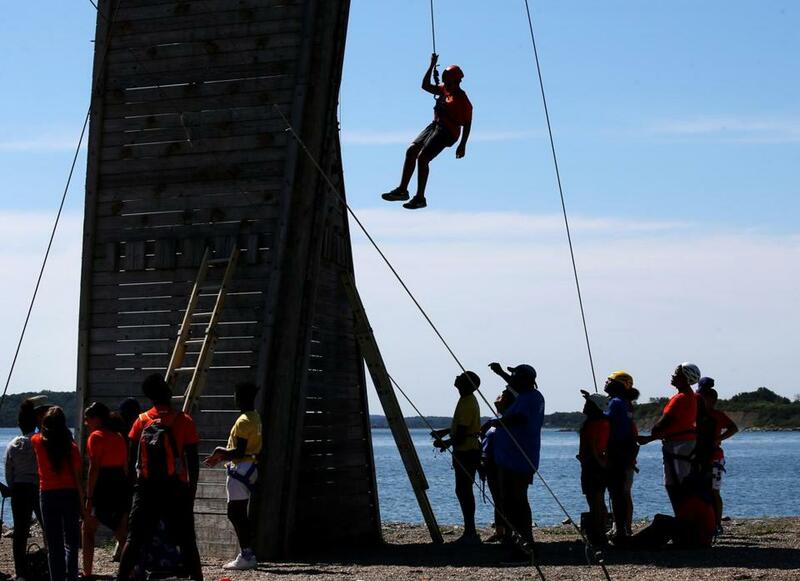 The day camp, now in its 12th year, serves 900 young Bostonians, ages 11 to 14, over two four-week summer sessions, plus the leaders in training . The camp was the brainchild of late former Boston Mayor Thomas Menino, and was founded by ad mogul-turned-philanthropist Jack Connors in 2007. Leadership trainees said the civics course has encouraged them and changed their outlook on social and political issues. Aboard a 30-minute ferry ride to Long Island Thursday morning, Connors chatted and laughed with some of the campers, all of whom donned orange shirts. While trainee Johanna Garcia, 16, sat on the top deck of the Provincetown II, she reflected on the protests fueled by the Parkland school shooting and what the civics course has taught her about leadership. 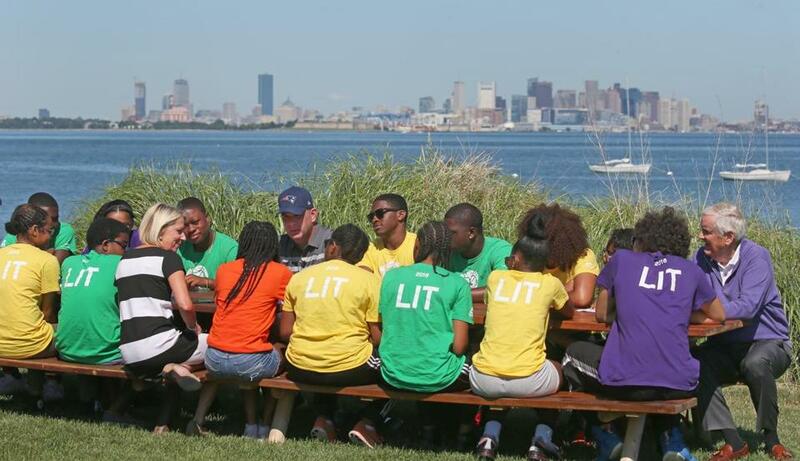 Mayor Marty J. Walsh (wearing cap) led a discussion Thursday with participants in Camp Harbor View’s leadership program. The camp is nestled on the island with a view of the Boston skyline across the harbor. It features sprawling fields, tennis courts, basketball courts, a rock-climbing wall, a pool, and water sports equipment. After disembarking and being greeted by Walsh Thursday morning, the campers quickly spread out, enjoying various camp activities. Sitting with the older teens on two picnic tables, Walsh provided insight on leadership and community engagement. The mayor — wearing a New England Patriots hat, a polo shirt, and his famed cargo shorts — was candid with the teens about his struggles with alcohol addiction and understanding race issues. Sharon McNally, president of the Camp Harbor View Foundation, said the staff wanted to institute the civics course to create “better citizens” and prevent learning loss during the summer. For urban teens, it’s crucial to have a safe space to create dialogue over social issues, according to Nicholas Johnson, a Northeastern University graduate student who teaches the civics class to the leaders in training.